For many, the concrete pour day is the most exciting day on an ICF jobsite. You’ve stacked your walls, everything is straight and plumb, and now it’s time for that sweet concrete. And that’s exactly how pump day should feel; fun and exciting, from beginning to end. Your wall is about to reach its full potential! But with great power comes great responsibility. Mistakes on pump day could cost you and your crew a lot of time and money. We at BuildBlock want your concrete pour to go as smooth as mud (pun!) 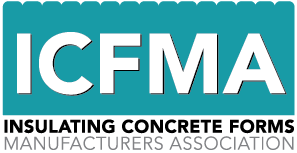 so we’ve compiled a list of five practices that will elevate your concrete pour to professional status. Several simple steps should be taken before pouring your project. Check your order as soon as it’s delivered to ensure that blocks look correct and nothing has been damaged in transit. Contact BuildBlock immediately if there is an issue with your order. Bundles should be carried carefully around the jobsite (easily accomplished with 2 people) to keep blocks in pristine condition. Never roll bundles around the site because this can damage the interlock or the blocks. Check that all block cuts, openings, vertical seams, and penetrations are braced and strapped adequately. Use proper stacking strategies: all blocks stacked with a running bond, firmly seated, and check all bracing before the pour. Check that rebar is placed correctly both vertically and horizontally inside walls. Make sure that J-bolts or other connects for the top of the wall are staged properly. Make sure that everyone has appropriate safety gear. Two: Before You Pump… SLUMP! This almost ranked first on our list for several reasons. Maintaining the proper concrete mix is critical to successfully pouring an ICF project. Much like having the correct ingredients in baking, the proper ratios in a concrete mix will influence its strength, workability, and the pressure created when pouring your walls. The best way to ensure that your concrete is mixed correctly is to administer a slump test. 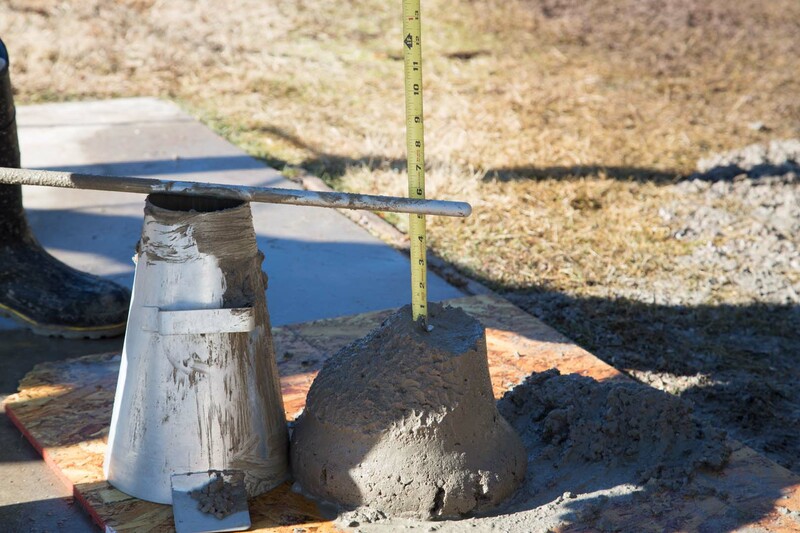 A slump test is simple and can be conducted with an Abrams cone, a tamping rod, and a tape measure. The cone is filled with fresh concrete in three stages. Each time, each layer is tamped 25 times to consolidate the concrete. At the end of the third stage, the concrete is struck off flush with the top of the mold. The mold is carefully lifted vertically upwards, so the concrete inside can settle naturally. The tamping rod is placed on top of the Abrams cone above the concrete. Slump is the distance between the tamping rod and the top of the concrete. Concrete that is wet (high slump) will settle more and have a greater distance between the rod and the concrete. 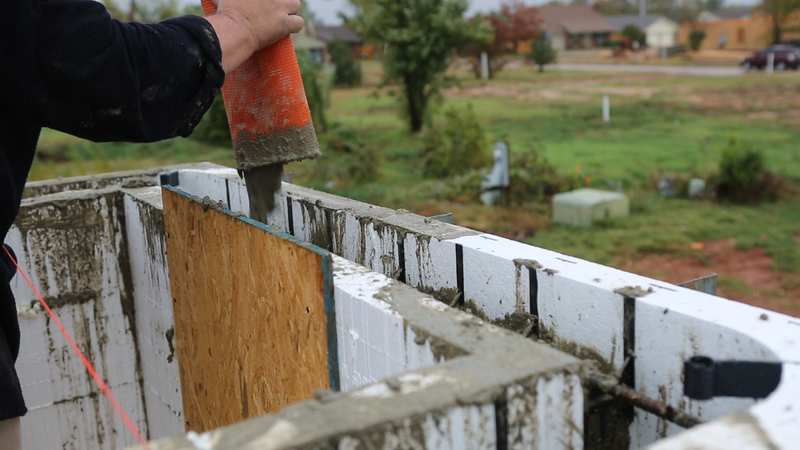 The recommended slump when pouring BuildBlock ICF walls is between 5 and 6 inches (concrete, when pumped under pressure, will lose a ½” of slump so you may want to add a ½” of slump to the concrete going into the pump hopper). This test is easy to administer and takes very little time. BuildBlock recommends testing concrete slump before pouring from each new truck. This may sound excessive but it ensures that you’re putting the right slump in the walls and prevents costly, time-consuming mistakes such as bulging or blowouts. For more information on slump and proper concrete mix design visit the Concrete Mix Design Page. 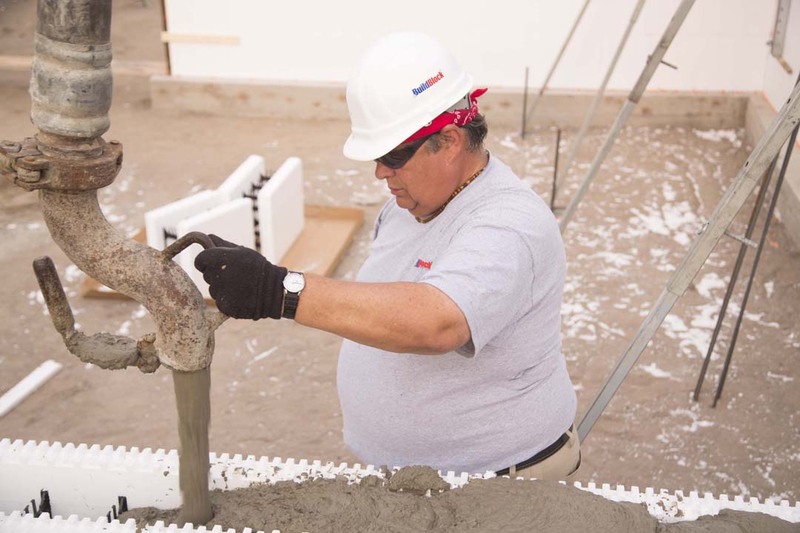 Once your concrete is tested and falls within the proper slump, you’re ready to pour. Go grab that hose, pick a random spot, and let it flow, right… Wrong! Before a concrete truck ever rolls onto your jobsite, you should have a plan for how the pour will go. Pick a starting location and work in a continual direction around the structure. Don’t aim concrete directly at the ICF forms. Instead, let concrete flow straight down and build up a mass. Let the concrete flow naturally and push it at a 45-degree angle so that it flows smoothly in the direction you are moving. 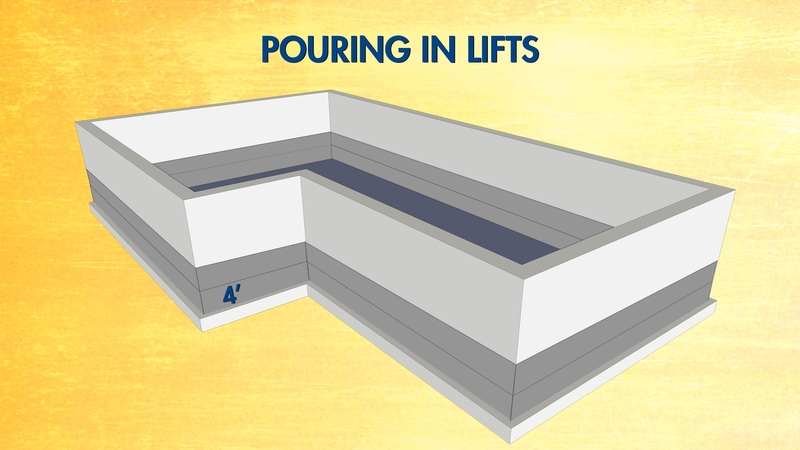 ICFs should be poured in lifts. What’s a lift? Great question! A lift is a specific height that concrete is poured to at any one time in a continuous pour until the full maximum height is reached. We recommend pouring your project in four-foot lifts. This height allows you to reach the bottom of windows during the first pass and ensures that not too much pressure is put on the lower forms. Once you reach four-feet, keep pouring without stopping another four-feet and repeat until the full wall height is reached. The pressure in the ICF forms is based on how high the concrete is poured at once. By pouring in lifts, the first part of the concrete starts to set up slightly (slake) reducing pressure on the lower forms. If too much concrete is poured in one place at one time the pressure build up could become too much for the ICFs to handle. BuildBlock ICFs are very strong and block failure is rare, but do yourself a favor and don’t risk it. No matter how solid your plan for pour day is, it all goes down the hopper if your team isn’t ready and aware of their responsibilities. Divvy up jobs and ensure that everyone on your site understands the plan for the day and their role within that plan. Someone to check concrete slump and communicate with the truck driver. Team member to pour concrete and communicate with the pump operator. Team members to inspect openings, determine the height of concrete in the wall, level concrete, and adjust bracing as needed. Someone to internally vibrate concrete (each lift is vibrated into the lift below). Team member to appropriately set anchor bolts or other top of the wall connections. Team members to continuously clean up around the site during the pour and ensure the entire site is clean after the pour. Communication is paramount on pour day. Clearly state the goal for the day and take the time to discuss any possible challenge areas with the team. Talking with your crew throughout the pour to ensure everyone understands their responsibilities creates a safe and efficient work environment. There are a few areas in most structures that should be treated with a little extra caution. When pouring around corners, avoid pouring directly into the corner. Instead, stay at least three feet back and flow concrete towards the corner from each side until you’re ready to top it off. This prevents excessive pressure from building up in the corner and causing issues. The same technique should be used around door and window openings. When pouring around windows, pour a small amount of concrete on either side of the window opening. Building up this small mass on either side prevents too much concrete from building up on one side of the opening and pushing the opening out of plumb or level. Flow concrete towards the opening instead of aiming directly at bucking. You can also pour and consolidate through the inspection ports in bucking on the bottom sill of windows. 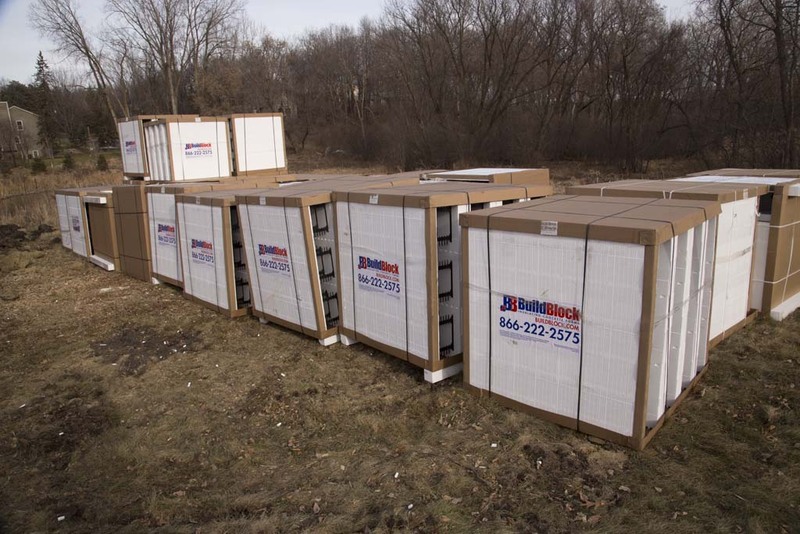 BuildBlock ICFs provide superior strength. 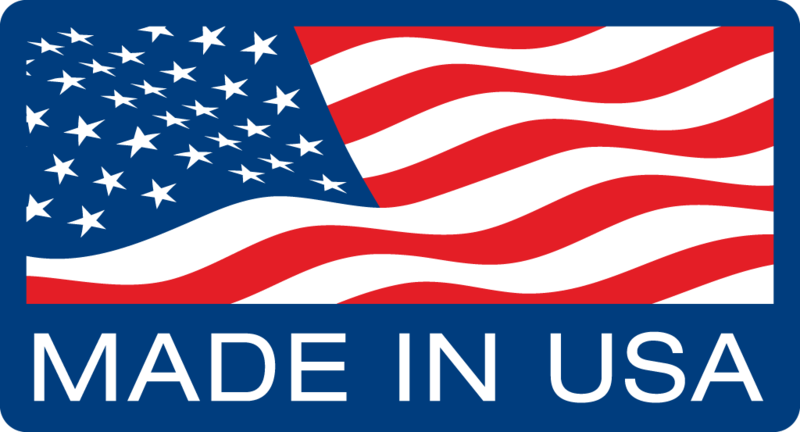 They are manufactured to perform exceptionally under most circumstances and block failures or blowouts are very rare. It takes a lot of effort (or a great lack of caring) to make your wall fail. If you meet project engineering and follow these five simple steps you’ll be set up for a fast, flawless, and fun concrete pour. For more information on how to properly pour an ICF project, watch this video in the BuildBlock ICF Installer Training Series. If you’re interested in learning how to build with ICFs from start to finish, visit training.buildblock.com and register for the free online training course.